I had to share this gorgeous Lady of Pain sculpted in brass. Wow! That is pretty awesome- and so accurate! Is that the original...or a reproduction? They just posted the photos. It looks like the original. OP in Twitter claims to show rare and obscure D&D franchise. Though some doubt its authenticity, in the comments below. David 'Zeb' Cook on Facebook wrote: I’m almost embarrassed to show this amazing gift from @DNDCollecting. It’s a truly generous thing to do. You can also read more about the sculpture at the Lady of Pain blog. Yes the CGI of Sigil are quite noteworthy too! Magnificent art, this fella nailed it. In the video he showed he made a bunch of those sculptures. Are they intended to be sold? If they are, I'd love to get my hands on one! 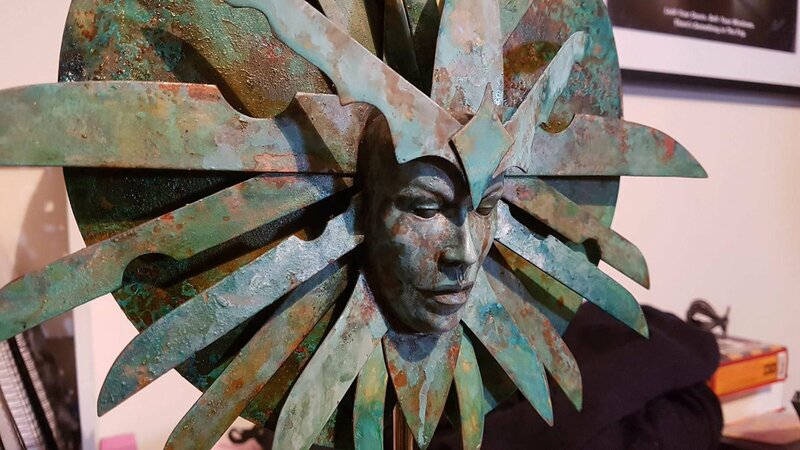 Me too; I started a 3rd Ed Planescape campaign back in 2005 (currently on hiatus), but I still use the original Planescape DMs screen and some other bits for visual aids/immersion/vibe, imagine if I had this to hang on the wall behind me during sessions! I could see this in Forbidden Planet, over here in London, would get a good price.